I am super excited to share the progress Droom has made since December 2015, which also marks completion of our 12 months of commercial operations. The first item sold on Droom platform was on 7th January 2015, when Balaji Motors sold a 2012 Bajaj Pulsar. Since then, Droom has come a long way. Droom started with the vision of making automobile buying and selling easy, quick and trustworthy. In last one year, we have been very busy creating an ecosystem of innovative tools and features for this vision. We achieved great milestones in last one year, as from listed GMV of ₹10 crores to ₹1000 cr, 20 sellers to 25K sellers, 20 listings to 90K listings and from 1 city to over 100 cities in India. 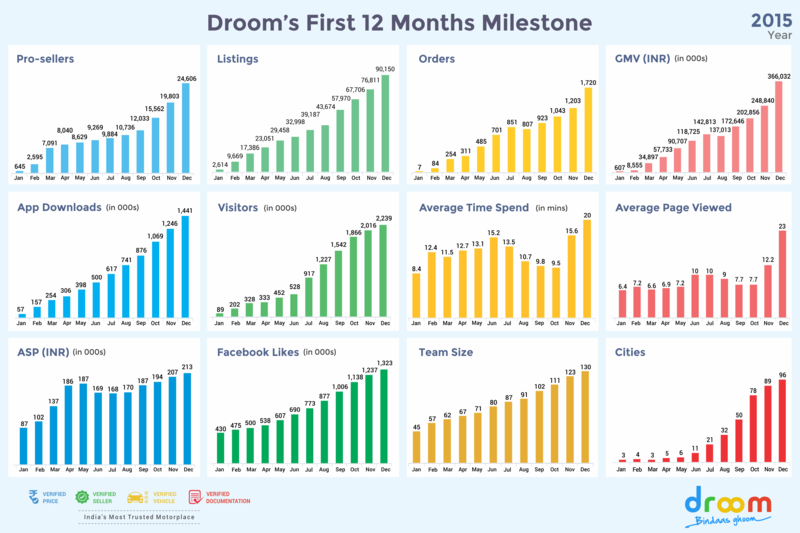 Droom also had 2.2 million monthly visitors, 1.4 million app downloads, and 1.35 million strong Facebook community. Our ecosystem has been expanding exponentially with 25k+ signed-up dealers, 20k+ active listings, and presence in nearly 100 cities across India. We successfully launched our first national level TV ad campaign (for bike and car) on 12th December 2015, celebrating the joy and pride of owning a pre-owned automobile. We have completely revamped the look and feel of our website and added various of new features providing users with 21st century buying and selling experience. We launched Orange Book Value (OBV), India’s only algorithm driven pricing engine to calculate fair market value for used automobiles. It is the only pricing engine in India that gives fair market value for a motorcycle, scooter, and plane besides car. This is not a regression model but a formula based pricing model, which has been tested and calibrated with thousands of transactions. Multiple Discovery tools are also available at droom.in to help buyers through various phases of buying a used vehicle. Total Cost of Ownership, Product Research, Pricing Research, EMI Calculator, and more, are the tools to help users make a smarter and more informed decision. Our Full Circle Trust program helps buyer know maximum details about the vehicle. We continue to be in rapid growth mode and constantly adding more features to our website and app. At last, thank you for your continued support. We will continue to make buying and selling experience better and better in India. WHY YOU SHOULDN’T MISS INDIA’S BIGGEST BIKE MELA at DROOM?